Aegean Airlines is to launch flights between Gatwick and Athens on October 28, complimenting its existing service from Heathrow to the Greek capital. The carrier has not officially announced the new route, but flights have loaded into Aegean’s online reservation systems at aegeanair.com as can be seen from the screen grab below. Business Traveller has requested full details of the new service from Aegean, and will publish more information here when available. 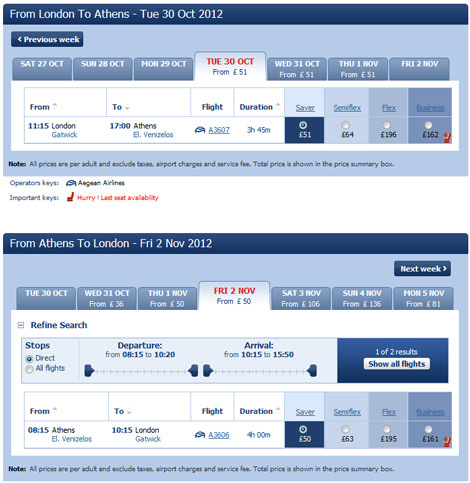 Easyjet flies between Gatwick and Athens, while BA and Aegean both offer services from Heathrow. For more information visit aegeanair.com.